you don't know what that is. We are bettering ourselves and becoming stronger through that struggle...or not, this is up to us. You can just as easily sit around talking about what isn't happening or what isn't fair or you can use this as a tool as the journey continues. The line between starting and standing is a very thin one so let's get walking. As I continue to uncover that life is a farm, I am also finding that there are so many beautiful and simple examples that help illustrate some of the themes I am recognizing in my short existence. Here you can see the chaos that ensues when a bed is left unkempt and weeds take over (All those darker green leaves are unwanted). On a farm, all your senses must be alert and aware of your surroundings, the farm and the greenhouse itself are living organisms that are constantly changing, dynamic worlds that needs to be cared for and monitored at all times. If you focus too much attention on one bed or one section of the greenhouse you can miss an entire battle going on somewhere else that is just as important. This is the beauty of the greenhouse, it's a living example of balance and once you step inside, you become a part of the balancing act. Once a bed is seeded, it's extremely important to keep an eye on it as the seeds germinate, just like a good parent, you can't just pop out a kid and walk away, it won't survive unless perhaps an awesome bear comes along and raises it. 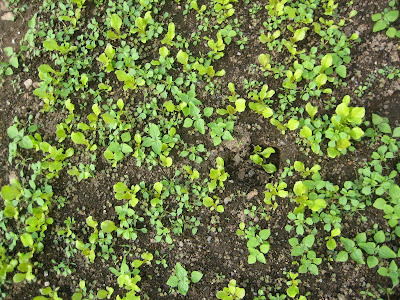 As the seedlings germinate, so do the leftover weed seeds that weren't raked out or in some other way managed to find their way into the bed. 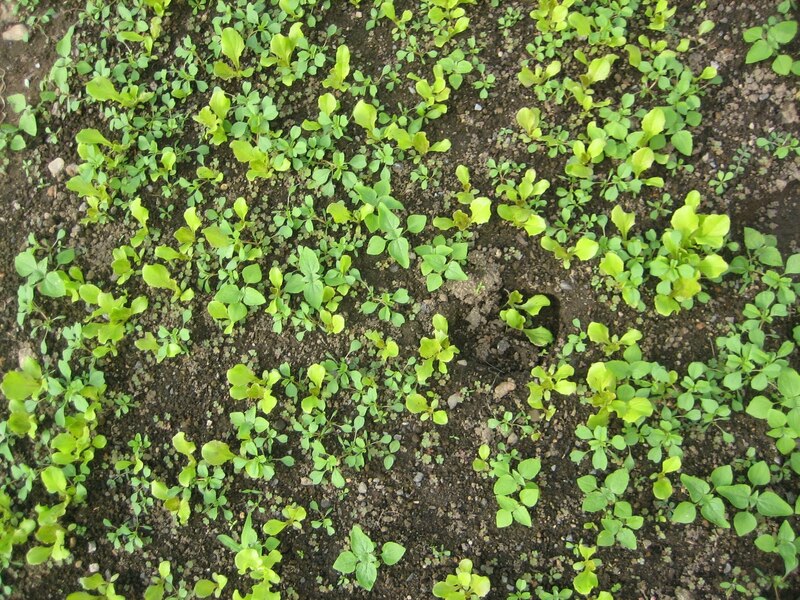 If I walk past a bed and see these little baby weeds encroaching on my little baby seeds, I am now in the know and faced with the decision to walk away or face this time consuming task head on. Just like with anything else in life, you can choose to face these battles or procrastinate while the problem gets worse and worse. The longer I wait to face this issue, the harder it will be to fix, to get through the weeds to my desired harvest. I have found this with anything in life from bad habits, eating well, starting a project, writing, business, relationships, etc. There's no better time than now because that climb to the top isn't going anywhere, so why not start now and see where that leads.